Welcome to the heart of spring in Vermont! 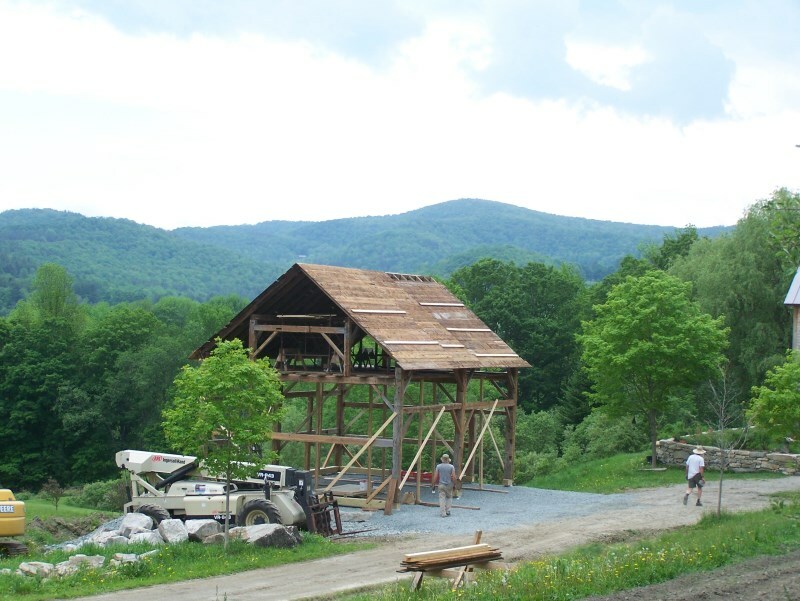 Last week in Pomfret, Vermont, beneath a canopy of new leaves and apple blossoms, we tipped up another beautiful timber frame barn. 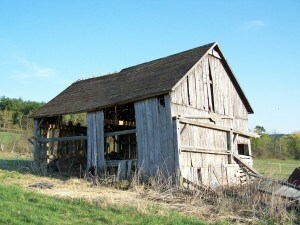 Below, you can see the barn as it originally stood in Benson, Vermont. This hand hewn frame, made of pine timbers, stood 21 feet wide x 30 feet long and was originally a meadow barn, built in the 1840s. 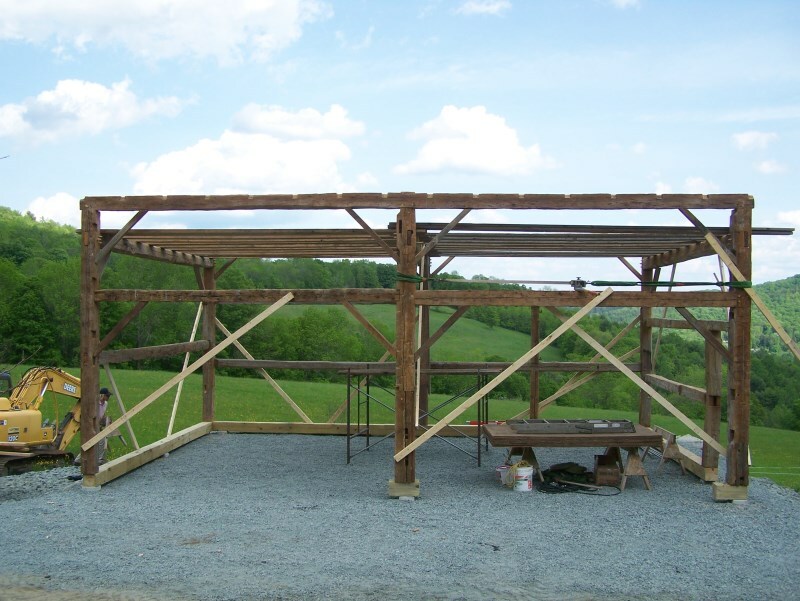 We took it down a few years ago, restored the structure and erected it at our workshop. We used it to store materials until recently, when it was chosen to fit the needs of a new owner. 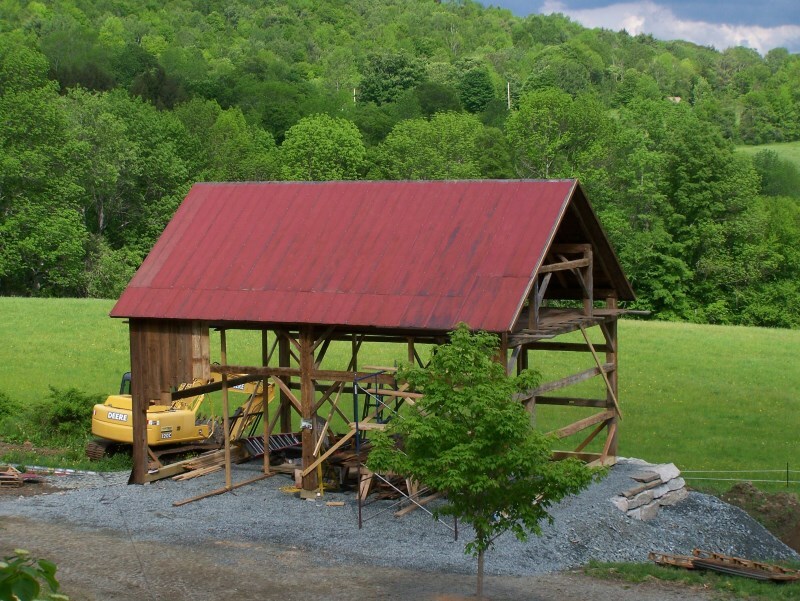 The goal of this barn restoration project is to erect the restored frame and finish the exterior and interior walls with seasoned barn boards. The owners want this “new” barn to look as if it has called the Pomfret site its home for at least 100 years. 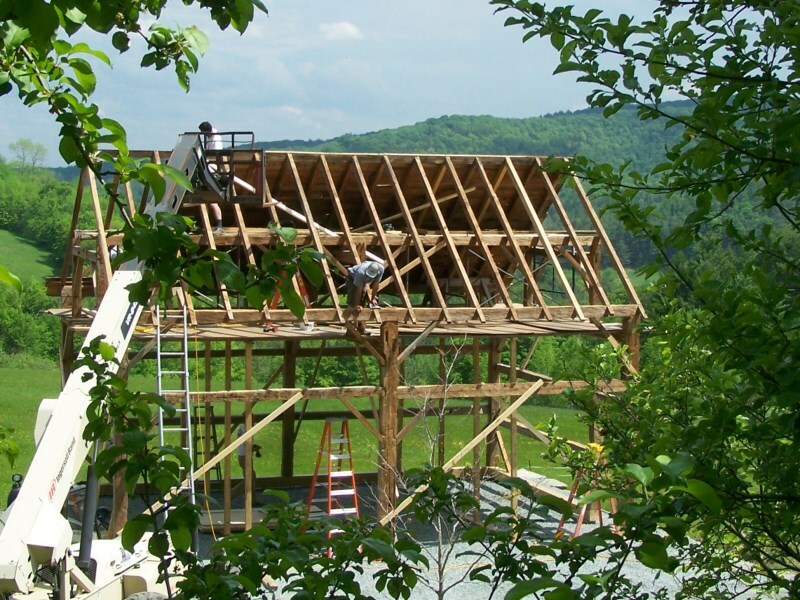 It’s no easy task to restore a timber frame, but the work is exciting and rewarding. 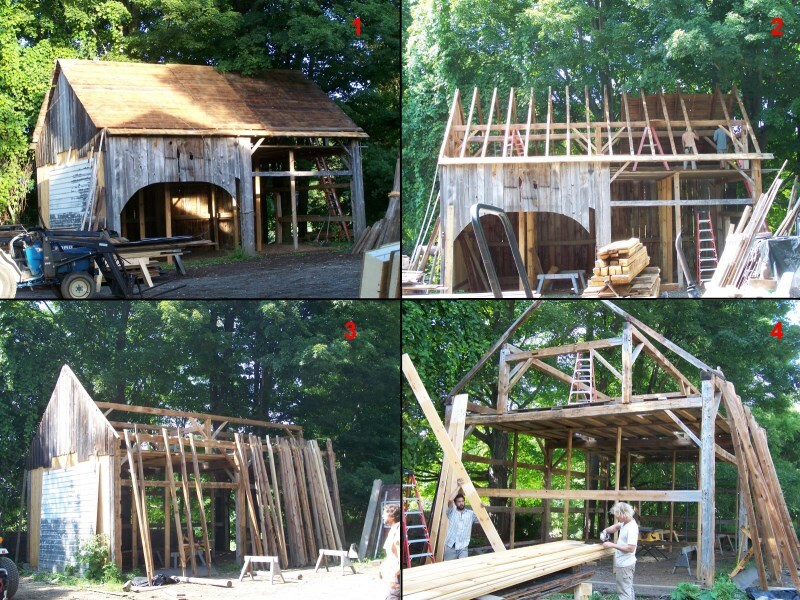 This past week, the crew of seven experienced timber framers made good progress each day, intent on creating “visual drama” for the new owner, and getting the job done. Here we are dismantling the previously restored frame to re-erect it in Pomfret. Once the frame was dismantled, we loaded it for transport to its new location in Pomfret. We were able to put the 175 year old beams back together in our first day’s work. The next step was to put up the roof system and roof boards. Since this frame stands 25 feet tall, we had to install a temporary work platform to reach the roof peak. From our safe perch on the temporary floor, we carefully set the roof rafters and applied the roof boards. Step 4: Putting on the Red Roof! The next step was to put on a recycled red roof. For this project, we took the roofing from another barn project we also have in progress. I love it when we are able to salvage old wood or materials from one job and use them on another. One person’s trash is indeed another person’s treasure in my line of work. Below is our third day of progress. On the fourth day of our efforts, we started applying the vintage siding. We’ll show the finished product in our next blog. Stay tuned! Every dreamed of living in a centuries old barn? Want to save a piece of New England history? Let me know! I’d love to hear from you! 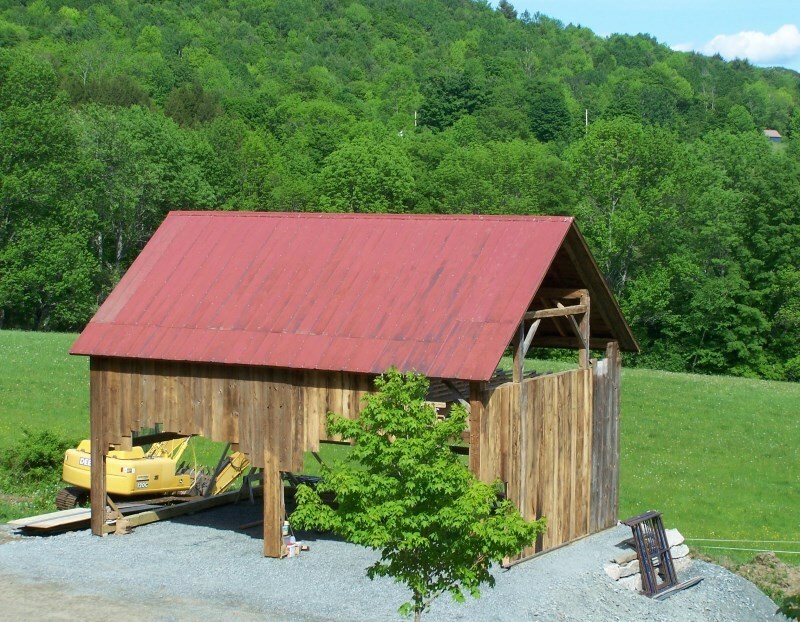 This entry was posted in Uncategorized and tagged American heritage, barn homes, dan mckeen, Green Mountain Timber Frames, Post and Beam, post and beam homes, reclaimed wood, restored barn frames, restored wood, timber frame, vermont barn home, Vermont timber frame, vermont timberframe by Green Mountain Timber Frames. Bookmark the permalink. Is that a dry stone foundation? It looks like a beautiful site in which to labor! it is indeed a lovely working site. The pressure treated 8×8 sills rest on concrete piers that are set 5 feet underground. the floor will be gravel. A pressure treated 3/4 inch plywood skirt will be nailed from the sill down to grade to close the gap between the sills and the gravel. It’s an affordable foundation if one doesn’t mind a gravel floor.